Just recently, my younger son called us to say that his wife had gotten pregnant; so they are expecting their second child. Happy news for our family. Perhaps a minute contribution to the shrinking population of Japan! It is said that such a demographic transition (coupled with a rapid increase of aged people) will have a profound impact on the nation, economically, politically, and socially. Taking this opportunity, I would like to ponder about this issue. First of all, here are some statistics. The population of Japan, being around 128 million now, started to shrink in 2005. According to the pundits, society will not sustain itself unless a woman in her lifetime produces more than 2.08 children, which is called “replacement-level fertility”. In Japan it’s around 1.26 (as of 2005). This low fertility rate is commonly observed in industrialized countries, the causes of which are said to be these three: a predominance of nuclear families, many women working outside their homes, and higher costs of raising children (especially education bills). Now, flip-flopping to Scandinavian countries that are known for taking effective measures to grapple with the problem; what can we learn from them? What I got from the Internet is basically this: first, obviously allowances of various kinds, second, and more importantly, the father’s participation in child care by taking a paid parental leave. For instance in Sweden, parents are entitled to a 480-day paid leave (out of which 60 days are specifically allocated for the father), resulting in more than 90% of fathers actually taking them. So, we can learn a lot from other countries’ experiences. The essence seems to be how well these measures are put into practice rather than how well they are provided by law or otherwise. A sad reality in Japan is that the statutory paid leave (by either parent for a period of 44 weeks at 30% of their salary) is rarely used by the father. I’ll stop here because further discussions that are already on the table will best be handled by pundits and professionals. But one thing is clear; that is how to make child care easier, if not a pleasure, rather than a “burden” to parents. Incidentally, I’m thinking right now to let my younger son’s family live with us; say a year, so that we, grandparents, can help raise the two grandchildren. 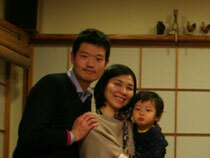 My younger son’s family, only his wife took a paid leave for 44 weeks and is now back at her full time work. Their 2-year old son goes to a day nursery. 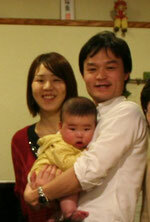 My elder son’s family, his wife also took a paid leave, taking care of her 5-month old son.